If you’ve visited websites with pages devoted to lizards, you’ve probably noticed something ironic. There seem to be far more of our native dragons and monitors kept as pets overseas than here in Australia. This is mainly because of how difficult our state wildlife authorities made it for residents to keep native reptiles. Fortunately, regulations are being relaxed and you now have a much better opportunity to enjoy these remarkable creatures. Although this country boasts an incredible range of lizards, those kept as pets are pretty much limited to the eastern and bearded dragons, monitors (goannas) and the eastern blue-tongue (actually a skink). When you encounter them in the bush, lizards are naturally skittish. However, bearded dragons and other small lizards can be calmed pretty easily and will adapt well to regular (and gentle) handling. While goannas and other larger lizards also get used to their owners in time, you should still keep a wary eye on them. Their claws are sharp and capable of some pretty nasty scratches. 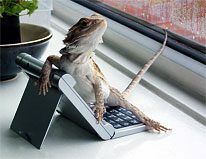 Licenses – Before you go running down to your local pet shop to buy a lizard, there are a few things you should know first. For starters, while they may be able to help you arrange to buy a lizard, pet shops in NSW are not licensed to sell reptiles. Breeders and specialised dealers are. And speaking of licenses, you’ll need one too. The Department of Environment and Conservation issues two types for reptile owners. A Class 1 license costs $60 for up to two years, can be issued to people 10 years or older and covers such easy-care lizards as dragons and blue-tongues. A Class 2 license is for reptiles that are rare, dangerous and/or hard to look after. While it also costs $60, this license only lasts one year and you have to be over 18 to get one. We should also add that it is illegal to take lizards from the wild. For more information, check out the website of the NSW Department of Environment and Conservation. Housing – Young lizards should be kept indoors. While a one-metre aquarium can be used, you should be aware that they can overheat. You should also be aware that dragons and blue-tongues live for some 20 years and do a fair bit of growing from the little babies you generally buy from dealers. Thus, a purpose-built vivarium made from timber with a wire or perspex front is the best way to go in the long run. While it doesn’t have to be as elaborate as the one shown below, you’ll want cross ventilation, as long as there are no draughts. Too much humidity will also cause lizards grief (see Health problems below). Cover the bottom with large gravel and provide hiding places. A pile of leaves, hollow log or terracotta pot will do fine. There should also be a shallow water dish that can’t be tipped over. Heating. Because dragons and other popular lizard species come from warmer areas of the country, they often need artifical heat to provide a stable environment. Place the heater at one end of the vivarium and create a gradient between 20° to 30°C to the other end. It’s a good idea to put a perch at the hot end for when your lizard wants even more warmth. Just be careful it can’t burn itself by directly touching the heat source. To help produce the calcium it needs, your lizard must have either access to sunlight for at least 30 minutes daily or artificial UV lighting that replicates the sun’s rays. Otherwise, there a good chance it could develop weak bones or rickets (again, see Health problems a little farther down). By the way, temperature and humidity control become all the more important if you decide you want to breed lizards. 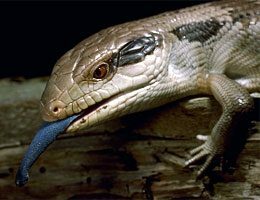 Feeding – Lizards benefit from a variety of foods. Three times a week feed a diet of five to 10 bite-sized pieces of snails, chopped hard-boiled eggs, insects (crickets, mealworms, cockroaches, worms), fruits such apple pieces and grapes, dandelion flowers, milk thistle, even commercial dog food (but it should constitute no more than 10% of the diet). 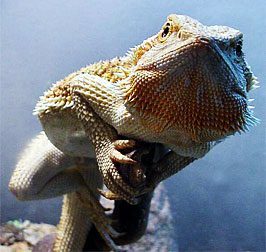 There are also commercial pellets for adult bearded dragons, but they should be supplemented with other foods. It is a good idea to dust one meal weekly with a reptile vitamin and mineral mix. 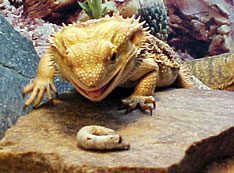 If you want to be sure of the freshness of the food your lizard gets, you can always breed your own mealworms or, for larger lizards, mice. One further important point: a shallow bowl of water should always be on hand. Handling and General Care – Several times a year your lizard will slough (shed) its skin. You’ll be able to tell when this is about to happen by the skin starting to appear dull, then opaque. 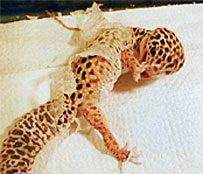 You should be extra careful when handling your lizard during this stage; the new skin underneath can be quite fragile. As noted above, providing something for your lizard to rub against can help the process along. However, if some skin refuses to be shed, a 10-minute soaking in warm water should allow you to gently pull the skin clear. Never use force and never leave your lizard unattended while soaking in the water. You will also need to have your lizard wormed annually. Metabolic Bone Disease. Unfortunately, this problem is both very common and quite serious, especially where lizards are housed indoors without sufficient exposure to ultraviolet light. Another contributing factor, particularly in young, growing lizards, is too little calcium in the diet. This deficiency eventually leads to a weakening of the bones. The signs: soft, pliable bones • distortion of the backbone • weakness and inability to lift itself • paralysis of hind limbs • eyeballs slipping out of malformed orbital rim • tremors and seizures. We’ll probably be able to diagnose this disease through a physical examination but may also need radiographs and blood calcium tests to be sure. Treatment begins with either weekly calcium injections for four to six weeks or oral supplements for two to three months. 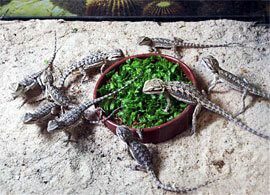 At the same time you should be correcting your lizard’s diet, adding more whole-prey items, dark green, leafy vegetables or calcium powder. Exposure to unfiltered sunlight is the best way to promote production of Vitamin D. And you should ensure your lizard is housed so that it can not climb and possibly injure itself. Dermatophilosis. The organism responsible infects the skin of lizards that are housed in excessively cold and damp conditions with insufficient dry hiding places. It primarily affects bearded dragons, but blue-tongues can be susceptible too. (The one to the right is the picture of health.) Because the organism lives in the soil, eradicating it from an enclosure usually proves extremely difficult. The signs: thickened, crusty and discoloured skin lesions • occasionally there will be multiple, small, well-demarcated nodules on the skin • lesions, mostly on the belly, but limbs, beard, eyelids and/or nose may also be affected. This is definitely a case of an ounce of prevention being worth a pound of cure. We may need to use general anaesthesia in order to remove all scabs and crusts. Then the underlying skin must be thoroughly cleaned every day with dilute povidone iodine. As well, we will have to begin a course of injectable antibiotics. Despite these efforts, lesions often recur. Meanwhile, you will have to thoroughly strip your lizard’s enclosure, cleaning or (preferably) discarding all furnishings. You should also get rid of the surface soil layer. Only after the dragon is clear of all lesions and the enclosure has been made drier and warmer should you reintroduce it to its home. Incomplete shedding of skin. ‘Collars’of dry skin form bands around the lizard’s wrists, toes and tail. This, in turn, leads to a loss of blood supply, eventually causing the extremity to die and dry out. And sometimes fall off. The signs: rings of dry skin around the limbs. Carefully cutting these collars of skin when they form relieves the problem. More information – We have covered some of the more important considerations for owning a lizard on this page, but there’s a lot more you should know. We suggest reading Care of Australian Reptiles in Captivity by John Weigel and/or joining a herpetological society. And, of course, you can call Bryn Lynar, our resident reptile vet.